Jlab is renowned Post Mortem Knives Manufacturer, Post Mortem Knives Suppliers, Post Mortem Knives Exporter, Hospital Surgical Equipments, Post Mortem Knives India. Jlab, We are engaged in manufacturing, exporting and supplying premium grade assortment of Post Mortem Knives. 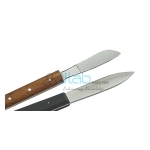 These knives are widely demanded in hospitals in post Mortem work for cutting application. Provided knives are manufactured victimisation quality-assured heavy duty carbon steel.